In Inman’s Special Report survey on real estate retirement, nearly 40 percent or respondents said they were trying to build a salable business for the future. 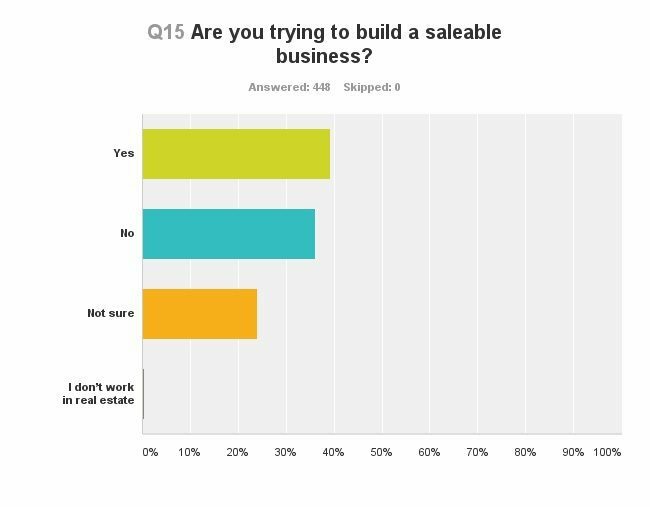 And for those hoping to sell their business as a whole, 29.7 percent said they would keep their business active and sell referrals, while 28.6 percent did not have a plan for their business. According to Virginia-based executive coach and trainer Chuck Boles, president of The Chuck & Buddy College of Business Knowledge, a successful agent is often evaluated by others on the number of sales volume they settle — and that is not what business buyers are looking for. He urges agents to create a database in their real estate practice that allows them to do an annual valuation — a rolling five-year historical average of their business growth patterns and values in key areas of their practice. The executive coach does not hold with the referral system. “The industry is too hung up on the old way of doing it, which is totally non-business based. Attorneys, dentists, CPAs and the like sell their practices because they are taught to build something salable from the outset of their careers. “The real estate industry focuses on making ‘transaction-to-transaction heroes,’ where success is recognized based upon the number of transactions and number of listings. That’s ego-building, not business-building,” he said. Boles suggests putting a value on each of your clients to get an idea of how truly valuable each client is. For instance, an A+ client is someone who has bought a home with you twice and referred you twice, so is worth, say, $1,000, while an A client is one who has done one transaction and one referral, worth $750. During the 6 to 12 months that the business seller and the new owner are working hand-in-hand, that new owner should be introduced at least twice to the A+ client and others at different tiers. “You are conveying the core values of client base to the custody of the new owner — passing the baton,” said Boles. Boles and other respondents stressed that the person coming in must be compatible if the transition is to be a successful one. “To be ultimately successful, the transition must be client-centric and for it not to be about the money or growing one’s book of business,” he said.